Why do people hesitate to embrace evolution? 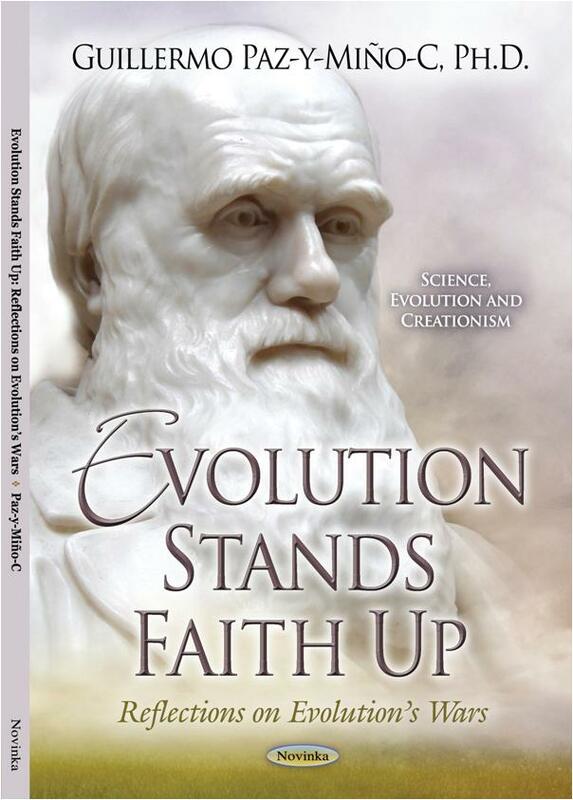 What triggers the controversy evolution-and-science versus creationism? What factors characterize the evolution wars? Will the conflict evolution-and-science versus religiosity ever end? 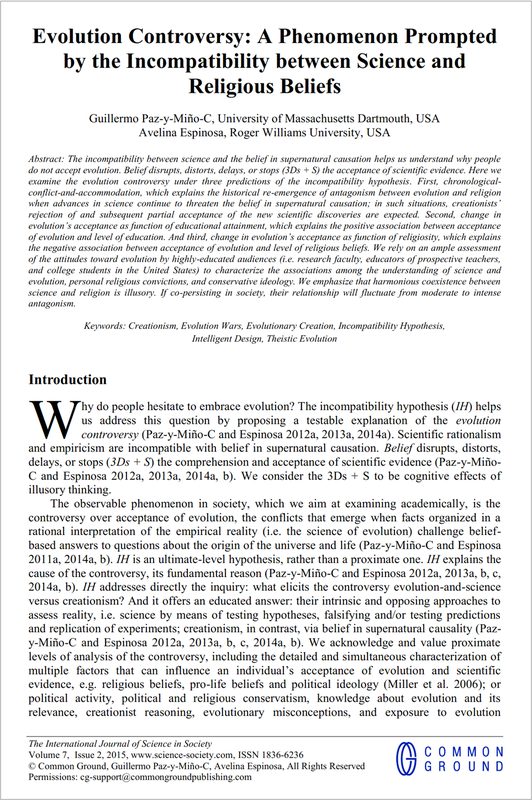 In a latest study published in the International Journal of Science in Society, Guillermo Paz-y-Miño-C and Avelina Espinosa address these questions under the conceptual framework of the Incompatibility Hypothesis, which the authors have proposed — EvoLiteracy. (1) Chronological-conflict-and-accommodation, which explains the historical re-emergence of antagonism between evolution and religion when advances in science continue to threaten the belief in supernatural causation; in such situations, creationists’ rejection of and subsequent partial acceptance of the new scientific discoveries are expected. (2) Change in evolution’s acceptance as function of educational attainment, which explains the positive association between acceptance of evolution and level of education. And (3) change in evolution’s acceptance as function of religiosity, which explains the negative association between acceptance of evolution and level of religious beliefs. The complete article, which includes 23-pages, 11 figures and 59 references, can be downloaded —for free— from the International Journal of Science in Society. Click on the images below to enlarge, or go to the journal website to download the PDF. Book: Paz-y-Miño-C., G & Espinosa, A. 2016. 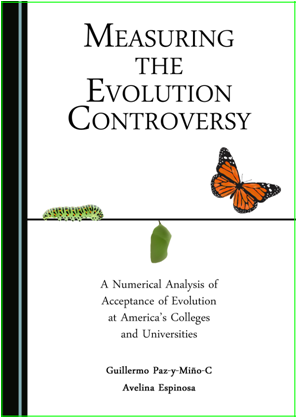 Measuring the Evolution Controversy: A Numerical Analysis of Acceptance of Evolution at America’s Colleges and Universities. Cambridge Scholars Publishing, Newcastle, United Kingdom. ISBN (10): 1-4438-9042-1, ISBN (13): 978-1-4438-9042-7. The publisher has made available a “VIEW EXTRACT” (in PDF), which includes the first 30-pages of the book: Cover, Table of Contents, Acknowledgments, Preface, Chapter ONE and the beginning of Chapter TWO. For PDF of color illustrations go to Image Resources of Didactic Relevance. — Mini Reviews: “Isaac Newton is said to have been a seriously religious man. Yet it is primarily due to Newton’s influence that science, unable to test propositions concerning the supernatural, focuses instead on finding natural causes for natural phenomena. Thus science is not a “belief,” but rather an epistemology aimed at understanding the natural world. In their welcome book, Paz-y-Miño-C and Espinosa succinctly draw the distinction between real science and the religiously-inspired belief in supernatural explanations for natural phenomena—including the origin and history of life. Why does the resistance to evolution persist in this modern day and age? The great contribution of “Measuring the Evolution Controversy” is the rich content of data and analysis that asks detailed questions about the social, economic and political backgrounds of those who tend to reject evolution versus those who accept evolution as science. The authors deftly analyze their data drawn from institutions of higher learning in the United States and particularly New England—which stands as a microcosm of the rest of the country, and indeed elsewhere in the world. It is their scientific approach to these issues which makes this book stand out as a uniquely original contribution.” Dr. Niles Eldredge, Curator Emeritus of Paleontology at The American Museum of Natural History, New York. — “Pro-science activists and educators constantly bemoan the resistance to the teaching of evolution in the United States. All of us have anecdotes about encounters with the public, parents and students who are misinformed by their churches, Religious-Right groups, and creationist organizations. Paz-y-Miño-C and Espinosa present hard data that support the anecdotal evidence. They also show that although anti-evolutionism typically begins with religion, it is a multi-faceted problem that intersects with political and cultural ideologies. Gathered through careful research over a period of years, their data will enable scientists and defenders of science education to comprehend the roots of the evolution controversy and counteract resistance to evolution more strategically and effectively.” Dr. Barbara Forrest, Co-author with Paul R. Gross of Creationism’s Trojan Horse: The Wedge of Intelligent Design (2007), and expert witness for plaintiffs, Kitzmiller et al. v. Dover Area School District (2005). Happy Friday everyone! Today’s EvoLiteracy News include: First, a behavioral study suggesting that blue whales might lack the innate behavioral repertoire to avoid collisions with cargo ships; after all, ships are relatively new, strange objects in the oceans, in contrast to the millions-of-years of whale evolutionary history in pristine environments. Second, a very important analysis on why scientist should avoid using bar-graphs to report data and, instead, go for more compelling alternatives for data depiction in scientific journals. And third, a super simple, yet powerful video on how to interpret population pyramids. Enjoy! — GPC. Blue whales have limited behavioral responses for avoiding collision with large ships. Published in Endangered Species Research. Why do blue whales not avoid collisions with cargo ships by simply swimming away or deep diving when danger approaches? It seems like the whales lack the behavioral repertoire to interpret the ships as danger; after all, cargo ships are new, foreign items in the whales’ natural environment; whales have evolved for millions of years without unnatural disturbances in the oceans. A new study by McKenna et al. (total five coauthors) brings some light into this problem, but clear-cut, definite answers are still needed. McKenna et al. summarize the research as follows: “Collisions between ships and whales are reported throughout the world’s oceans. For some endangered whale populations, ship strikes are a major threat to survival and recovery. Factors known to affect the incidence and severity of collisions include spatial co-occurrence of ships and whales, hydrodynamic forces around ships, and ship speed. Less understood and likely key to understanding differences in interactions between whales and ships is whale behavior in the presence of ships. In commercial shipping lanes off southern California, [the authors] simultaneously recorded blue whale behavior and commercial ship movement. A total of 20 ship passages with 9 individual whales were observed at distances ranging from 60 to 3600 m. [The researchers] documented a dive response (i.e. shallow dive during surface period) of blue whales in the path of oncoming ships in 55% of the ship passages, but found no evidence for lateral avoidance. Descent rate, duration, and maximum depth of the observed response dives were similar to whale behavior immediately after suction-cup tag deployments. These behavioral data were combined with ship hydrodynamic forces to evaluate the maximum ship speed that would allow a whale time to avoid an oncoming ship. [The authors’] analysis suggests that the ability of blue whales to avoid ships is limited to relatively slow descents, with no horizontal movements away from a ship. [The authors] posit that this constrained response repertoire would limit their ability to adjust their response behavior to different ship speeds. This is likely a factor in making blue whales, and perhaps other large whales, more vulnerable to ship strikes.” Open access to PDF of paper is available at ESR. Should scientific journals request authors to change their practices for presenting continuous data in small sample size studies? An article in PLoS Biology recommends it. I will simplify the complexity of the Weissgerber et al. paper (although it is very friendly written) by addressing only what is substantial and eliminating the technicalities. However, readers might need to explore the content below with quality attention. Weissgerber et al. (PLoS Biology 2015) examined 700 studies published in reputable physiology journals. They “focused on physiology because physiologists perform a wide range of studies, including human studies, animal studies, and in vitro laboratory experiments.” The authors found that 86% of the studies reported statistical analyses in bar graphs, which can be misleading, particularly when small samples are being measured. They explain this in three main figures. Below, I summarize the Weissgerber et al.’s images and text, plus include explanations in color to facilitate the interpretation of the material (remember that the original article can be downloaded from PLoS Biology). First: fundamentally different data sets could lead authors to report the results [and statistics] in bar graphs and draw from them unwarranted conclusions. Adapted from Weissgerber et al. (PLoS Biology 2015). Click on image to enlarge. Many different datasets can lead to the same bar graph, as depicted in the example of Panel A (above), a common practice in 86% of the scientific papers examined by Weissgerber et al. (PLoS Biology 2015). For instance, Panel A depicts two seemingly different groups, the black bar on the left is lower than the white bar on the right. Is this difference true and for the reasons we think? The visualization of the full data (as depicted in Panels B, C, D and E) may suggest different conclusions as cautioned by Weissgerber et al. (PLoS Biology 2015). Panel B: look how the data-point distributions in both groups appear symmetric. Although the data suggest a small difference between these groups, there is substantial overlap between groups (the position of many of the dots on the left clearly overlaps with the position of the dots on the right). Panel C, the apparent difference between groups is driven by a single outlier. Panel D suggests a possible bimodal distribution of the data points. Additional data are needed to confirm that the distribution is indeed bimodal and to determine whether this effect is explained by a covariate. Panel E, the smaller range of values in group two (right) may simply be due to the fact that there are only a few observations (four data points). Additional data for group two would be needed to determine whether the groups are actually different. Second: A common assumption in bar graphs is that the reported groups are not only different, but also independent. And that might not always be the case. The bar graph on Panel A (mean ± SE, where SE is Standard Error) suggests that the groups (black and white) are independent and provides no information about whether changes are consistent across individuals. Panel B, data point values for every subject on the left group are higher on the right group (a one to one correspondence, they are closely associated). Panel C, there are NO consistent differences between the two conditions (i.e. the data points, or “subjects,” on the left group behave erratically in respect to their counterparts on the right group: some lines go up, others go down, others are roughly horizontal, which indicates no clear pattern, nor close association between the groups). Third: Scatter plots are better alternatives to reporting data than bar graphs, particularly of small samples. And, using Standard Deviation lines, instead of Standard Errors, might be more informative to readers. Bar graphs discourage the reader from critically evaluating the statistical tests conducted in the analyses and the authors’ own interpretation of the data. Panel A presents data in bar graphs showing mean values (the height of the bars) ± SE (Standard Errors, or the “T” shaped lines on top of the bars). Panel A suggests that the second group (white bar) has higher values than the remaining groups. But this might not be necessarily true because the Standard Errors measure only “the accuracy of the mean.” However, see what happens in Panel B (below). 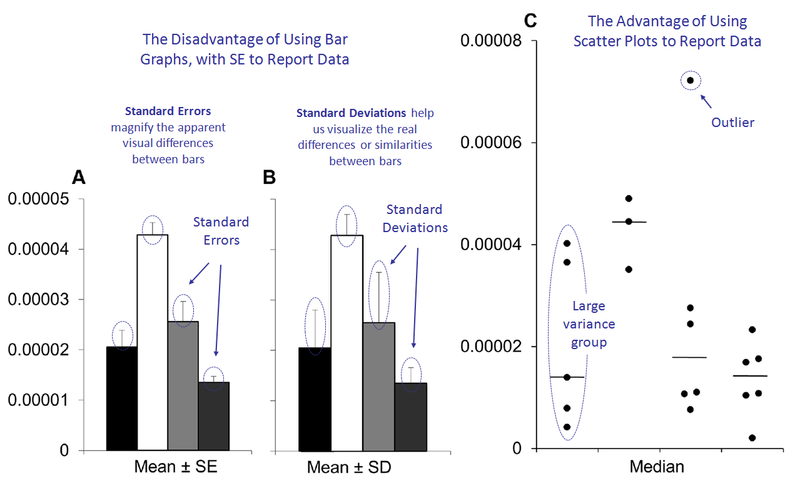 Panel B presents data in bar graphs showing mean values ± SD (Standard Deviations, or the “longer T shaped lines” [in respect to those of Panel A] on top of the bars). Note that Panel B reveals that there is considerable overlap between groups (i.e. the horizontal projections of the “T” shaped lines overlap with one another). This is because Standard Deviations measure “the variation in the samples,” rather than the accuracy of the mean as in the case of the Standard Errors. Thus, showing SE (Panel A) rather than SD (Panel B) magnifies the apparent visual differences between groups, and this is exacerbated by the fact that SE obscures any effect of unequal sample size. Yet, Weissgerber et al. (PLoS Biology 2015) indicate that the scatter plot (Panel C) –a better alternative to A or B– clearly shows that the sample sizes are small in all groups, plus group one has a much larger variance than the other groups, and there is an outlier in group three. These problems are not apparent in the bar graphs shown in Panels A or B. The complete article, supplementary materials, and companion Excel file to assist readers conduct similar analyses can be downloaded from PLoS Biology. Today, my picks for EvoLiteracy News include: First, the 2014-2015 report on best college-cities released by the American Institute for Economic Research; different from other assessments, which are often student-satisfaction oriented, the AIER report concentrates on more serious metrics. 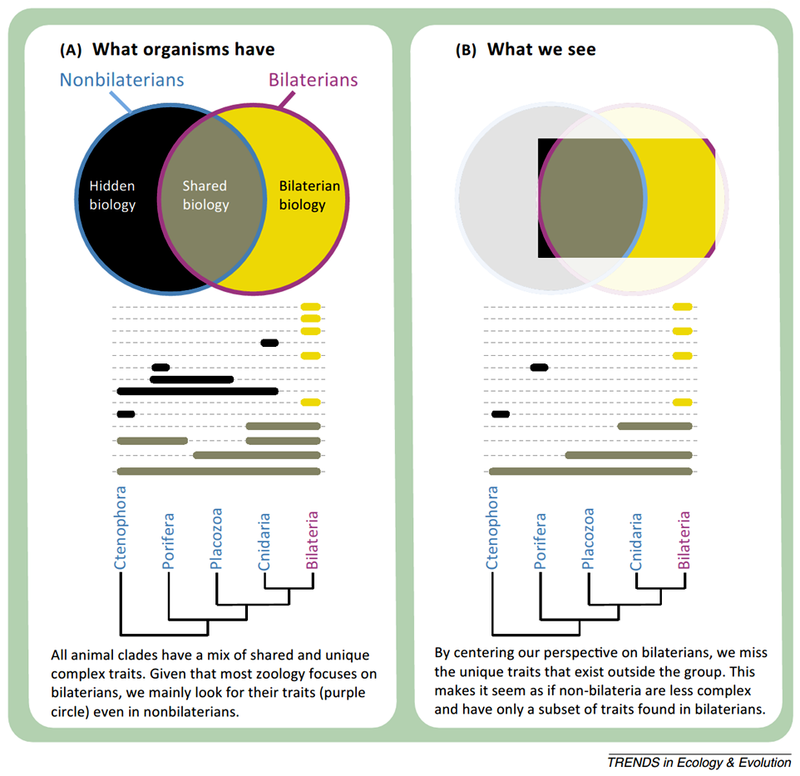 Second, a review of the placement of sponges and comb jellies in phylogenetic reconstructions of all animals, with new ideas on how to improve our understanding of the evolution of “animal complexity.” Third, an overview of biodiversity extinction rates worldwide, which suggests a fast speed of species decline associated with climate change. The video treat of the day comes from TEDEd and is about “Biodiversity” (ecosystems, species, genetics). Enjoy! — GPC. 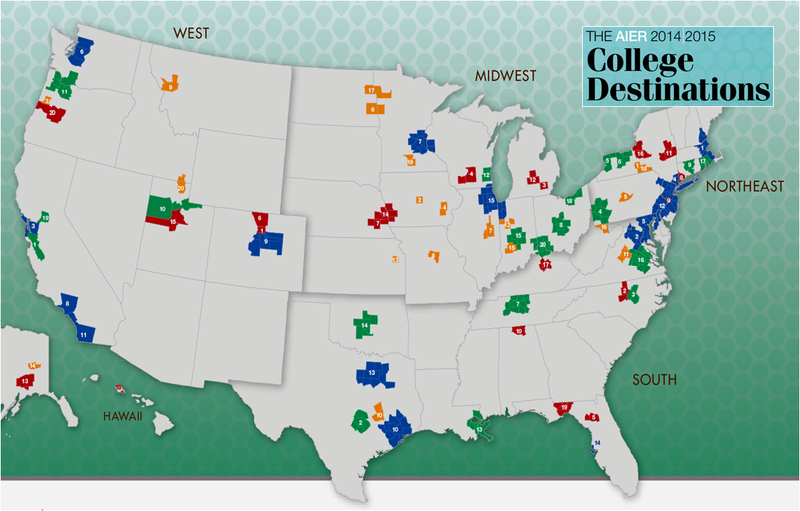 Top College Cities in the US, AIER 2014-2015 Report. The American Institute for Economic Research (AIER) has released its 2014-2015 College Destination Index, which ranks 75 college-/ university-cities (large, medium-/ small-size metropolitan areas, and small towns) in the United States, according to 4 categories and 12 criteria. The Top 15 Major Metropolitan Areas include Boston MA, Washington DC, San Francisco CA, New York NY and Baltimore MD (plus ten others). The Top 20 Mid-Size Metropolitan Areas: San Jose CA, Austin TX, Raleigh NC, Pittsburgh PA and Buffalo NY (plus fifteen others). The Top 20 Small Metropolitan Areas: Boulder CO, Durham NC, Ann Harbor MI, Madison WI and Gainesville FL (plus fifteen others). And the Top 20 College Towns: Ithaca NY, Ames IA, Corvallis OR, Iowa City IA and State College PA (plus fifteen others). 1st category Student Life, which includes the following criteria: student concentration, cost of housing, and city accessibility. 2nd category Economic Health, which includes: arts and leisure, international students, and innovation producers. 3rd category Culture: employment rate, entrepreneurial activity, and brain drain or gain. 4th category Opportunity: research and development per student, college educated, and earning potential. The complete report is available at AIER. The hidden biology of sponges and ctenophores (comb jellies), published in Trends in Ecology and Evolution. Ctenophores or sponges are the sister group to all other animals. Biases hide some complex traits in these animals and make them appear simpler than they are. These biases supported the misconception that living animals represent grades of complexity. It is critical to investigate the unique but hidden biology of ctenophores and sponges. Hypotheses proposed for the phylogenetic relations between sponges, ctenophores, and other animals. (A) Porifera is the sister group to all other animals. Ctenophora and Cnidaria are sister groups, forming Coelenterata. (B) Porifera is the sister group to all other animals. Ctenophora and Bilateria are sister groups, forming Acrosomata, a relation recovered in some morphological analyses but no molecular analyses. (C) Ctenophora is the sister group to all other animals. Some analyses that recover this result also place Placozoa, Bilateria, and Cnidaria in a clade that has been called ‘Parahoxozoa’ (click on image to be redirected to TREE). The complete study is available at TREE. Accelerating extinction risk from climate change. South America, Australia and New Zealand at highest risk. Science Magazine. The complete report is available, in full, at Science Magazine.